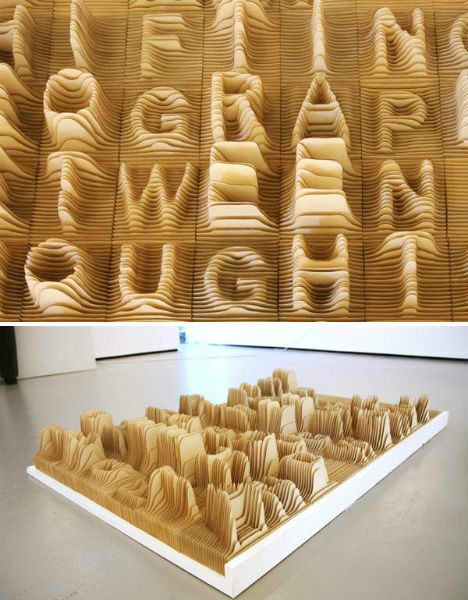 Capturing every dip, curve and peak of the surface shape of the land, topography can be highly symbolic of a love for the earth in general, for a specific city or simply for the beauty of the lines themselves. 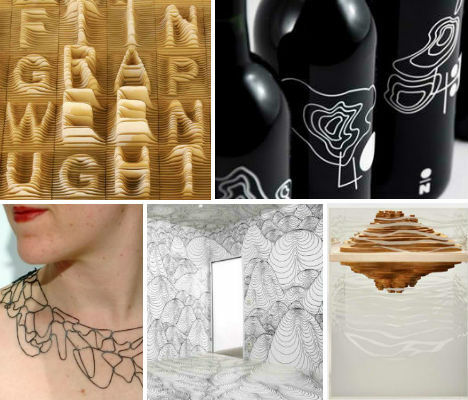 These 13 works of art and design, from hand-drawn topography on entire gallery walls to decorative relief maps of San Francisco, celebrate this field of science in a highly engaging, visual way. 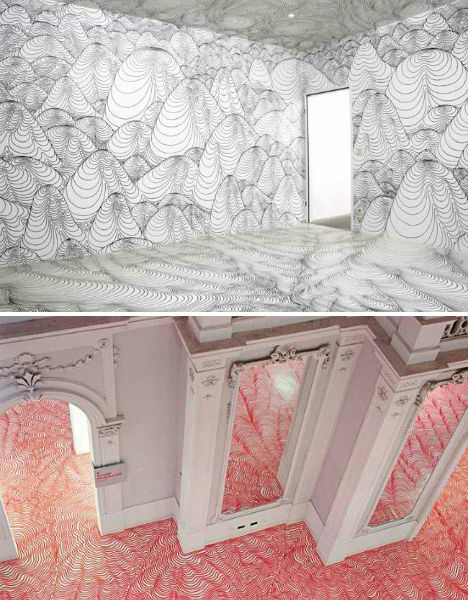 An entire room suddenly becomes a strange, abstracted landscape with the topographic renderings of artist Heike Weber. This is no regular-sized drawing that was blown up and adhered to the surfaces; Weber hand-drew the lines onto acrylic floor and wall surfaces. He has spent untold hours covering thousands of square feet over his career. 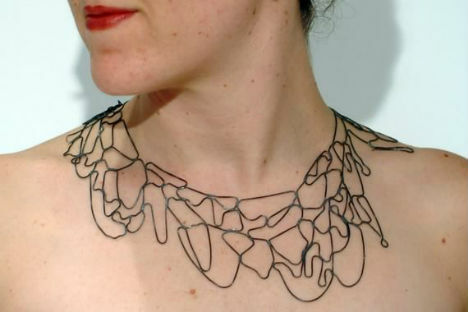 Looking like it was cut from a topographic map, this necklace by Melissa Borrell conforms to the shape of the wearer’s body, with flexible lines that ‘map the shapes that they follow’. 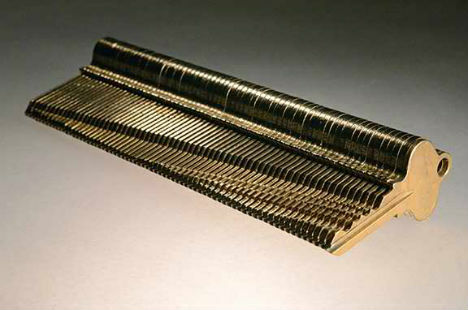 It’s made of oxidized silver, white gold vermeil or 18K yellow gold vermeil. 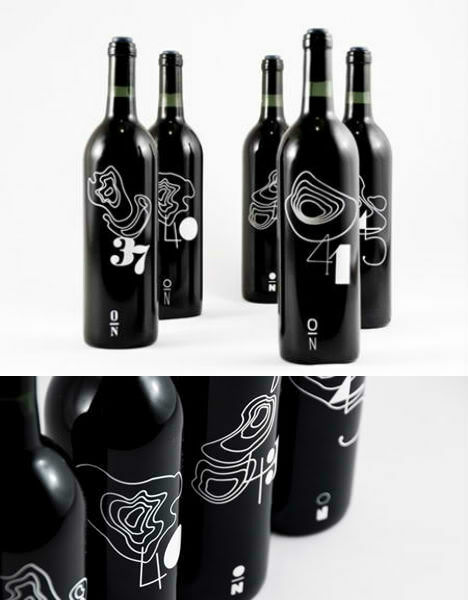 The topographic illustrations on this concept for wine labels by designer Rob Schellenberg were not simply chosen for their beauty, or due to an appreciation of topography on the part of the artist. 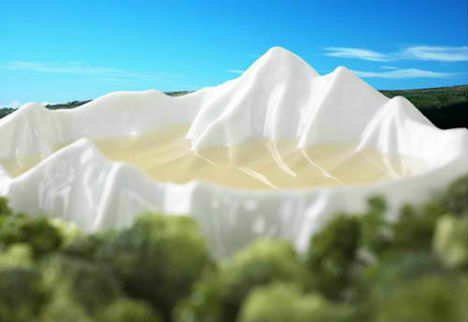 They actually represent the regions of Italy where specific types of wine are grown and bottled. 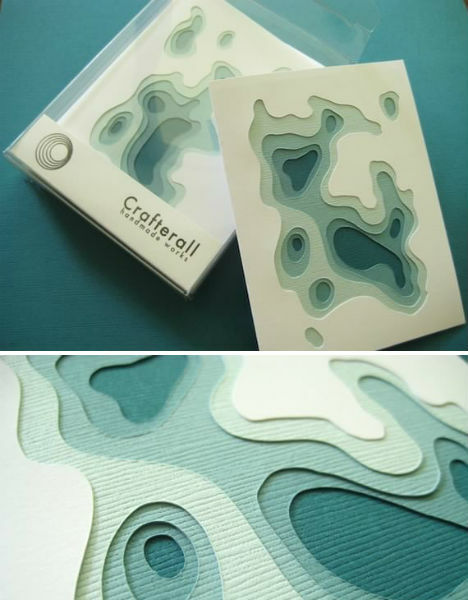 Spread the topography love with a set of four hand-cut cards by Crafterall. The Etsy seller cuts layers of craft paper in soft shades of teal, layering them into landscapes. Additional colors are available in the Crafterall shop. 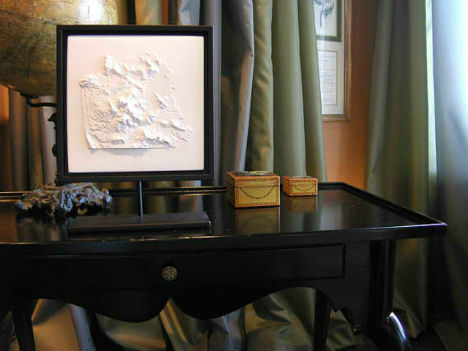 Sisters MIcol and Sael Bartolucci of Isotrope Design craft highly unusual tables and other functional art pieces, insider by landscapes and topography. 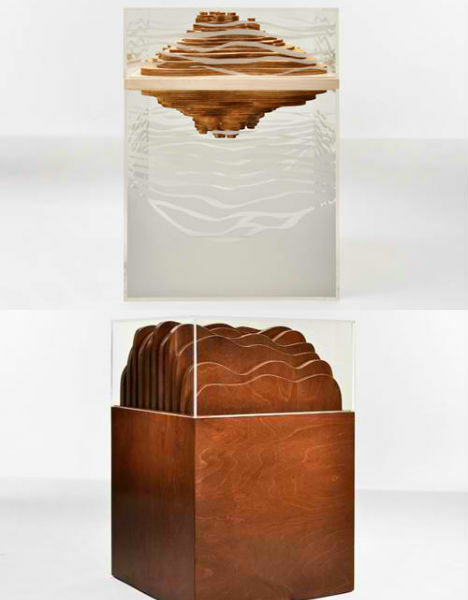 ‘Geo’, top, is layered pine inside an acrylic case; ‘Alpi’ is made of acrylic and birch. 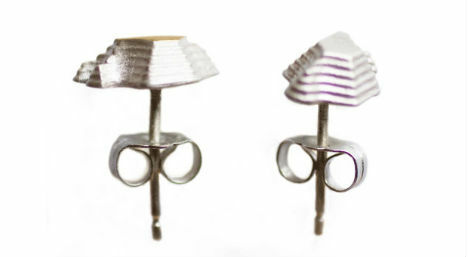 Wear topographic imagery in a slightly more subtle way with the ‘Topography Studs’ by Mociun. These tiny earrings are hand-made of sterling silver in New York City. 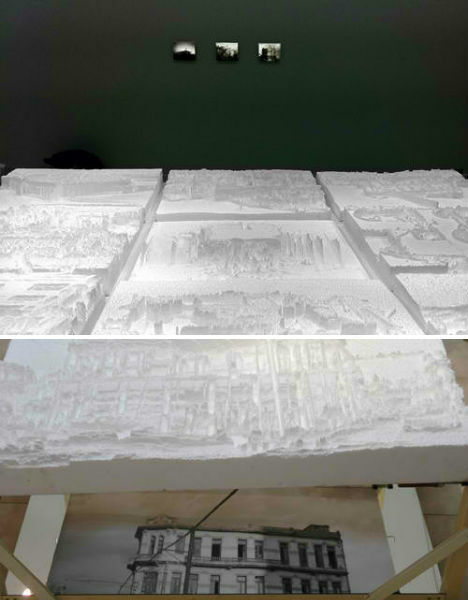 The terrain of San Francisco is turned into an art piece in the form of a white gypsum relief tile in a black wood frame. Made in San Francisco, the tile is a subtle and visually interesting homage to the city. 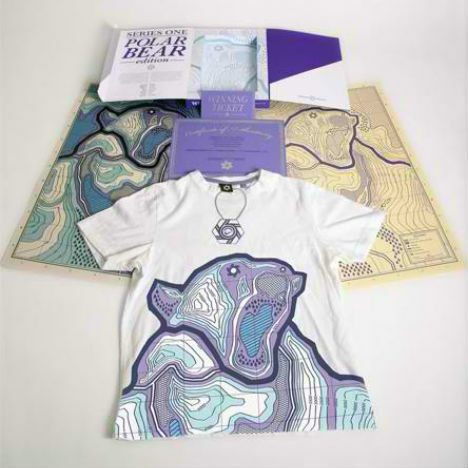 The rapidly changing topography of the Arctic Circle is frozen in time on this series of t-shirts, maps and other products by Sixpack France. The hidden topography of architectural photos is revealed in these highly detailed works by Carlos Garaicoa. For the series ‘Photo-topography’, Garaicoa converts black and white images into relief topographies by routing the dimensions of the photo into blocks of polystyrene.